LOS ANGELES – On July 5, The Los Angeles Angels acquired left-handed relief pitcher Joe Thatcher and outfielder Tony Campana from the Arizona Diamondbacks in exchange for outfielder Zach Borenstein and right-handed pitcher Joey Krehbiel. Thatcher, a 32 year-old Kokomo High School graduate, has appeared in 37 games this season out of the Arizona bullpen, pitching to a 1-0 record and 2.63 ERA (24 innings pitched, seven earned runs) with 25 strikeouts and three walks. His 8.33 strikeout-to-walk ratio this season ranks second in the National League behind Clayton Kershaw (9.73). Thatcher has an active streak of 23 consecutive appearances without walking a batter (13.1 IP, 53 batters faced) which is the longest active streak in the Majors and is a new Diamondbacks franchise record. Since 2007, he ranks third in the Majors in inherited runners scored percentage, having stranded 242 of 300 inherited runners (80.67 percent). 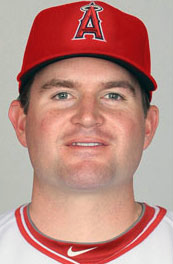 Thatcher was originally signed as a Minor League free agent by the Milwaukee Brewers in 2005. He was traded to San Diego on July 25, 2007 and made his big league debut with the Padres the following day. He appeared in 287 games with San Diego from 2007-2013, posting an 8-11 record with one save and a 3.18 ERA (198.1 IP – 70 ER) before being traded to Arizona on July 31, 2013. In 59 career games with the D-backs, Thatcher has gone 1-1 with a 3.78 ERA (33.1 IP – 14 ER). He has held left-handed batters to a .221 batting average against (92/417) for his career. Overall, owns a 9-12 lifetime big league record and a 3.26 ERA (231.2 IP – 84 ER) with 242 strikeouts and 78 walks. The Kokomo southpaw is currently second in most Major League games played by a KHS graduate. He trails Tom Underwood by 32 games, 379-347.